Gothenburg-based design studio PinPin Studio recently sculpted a children’s playground entirely out of ice and snow for a winter festival in Kiruna, Sweden. Created in collaboration with ICEHOTEL, LKAB, Tekniska Verken, and students from Hjalmar Lundbomsskolan, the temporary winter wonderland is free to the public and can be enjoyed by people of all ages. The expansive playground, which features a big maze, slides, and other sculptural elements, was built in less than a week in January. “The inspiration and key elements behind the playground is adventure and exploring,” writes Christian Strömqvist, a co-founder of PinPin and MFA Child Culture Designer. “PinPin wants the park visitors to feel like they are explorers finding a lost city in the middle of a snow and ice jungle. The imaginary play is just as important as the active play.” The Kiruna Winter Playground’s most eye-catching feature is the 13-foot-tall maze with walls made from both opaque, hard-packed snow and translucent ice taken from nearby Torne River. The ice walls were organized in a cross formation to allow light and views to penetrate through the maze at select points and to enhance the directional confusion. The park is surrounded by two gigantic snow hills that mark the boundaries of the site and provide the base for the two parallel slides made from ice. The playground also features a large snow lantern that glows bright yellow at night, as well as other interactive snow sculptures. The park will remain open until it melts down in the springtime around April. 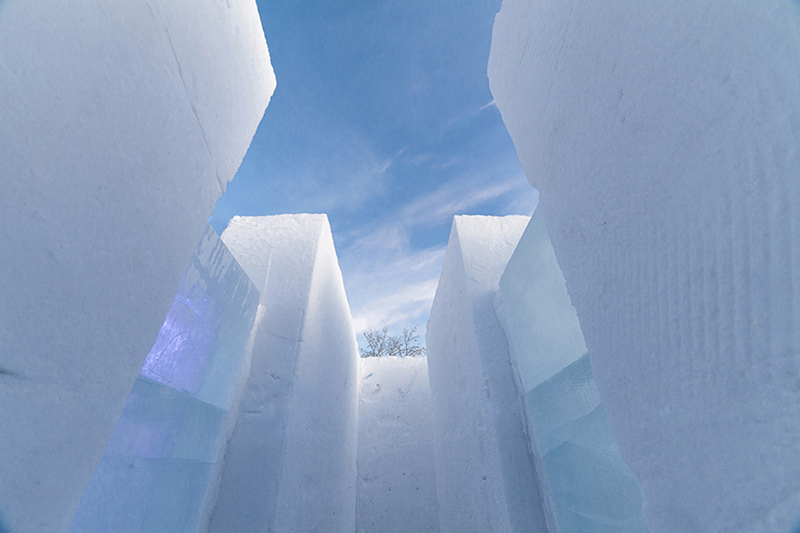 The ice walls were organized in a cross formation to allow light and views to penetrate through the maze at select points and to enhance the directional confusion. "The inspiration and key elements behind the playground is adventure and exploring," writes Christian Strömqvist, a co-founder of PinPin and MFA Child Culture Designer. 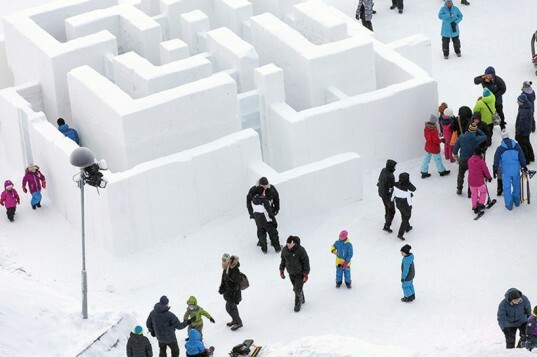 The Kiruna Winter Playground's most eye-catching feature is the 13-foot-tall maze with walls made from both opaque, hard-packed snow and translucent ice taken from nearby Torne River. The park is surrounded by two gigantic snow hills that mark the boundaries of the site and provide the base for the two parallel slides made from ice. The playground also features a large snow lantern that glows bright yellow at night, as well as other interactive snow sculptures. The park will remain open until it melts down in the springtime around April.